A Chinese TV station has incurred the wrath of Lady Gaga’s loyal legion of Little Monsters, after they blurred out the face of their adored Mother Monster. While broadcasting the 2019 Oscars ceremony, Mango TV obscured Gaga’s face and even went as far as to delete her performance of Oscar-winning song Shallow. The 32-year-old had performed the track as an intensely emotional duet with her A Star Is Born co-star Bradley Cooper, with the undeniable creative chemistry between the pair becoming one of the most talked about aspects of the evening. However, this powerfully beautiful moment was snipped completely from Mango TV’s broadcast, sparking suspicion that the singer and actor had in fact been censored by Beijing. This strange omission of Gaga’s face and performance came to light after strange screenshots from Weibo began circulating around social media. 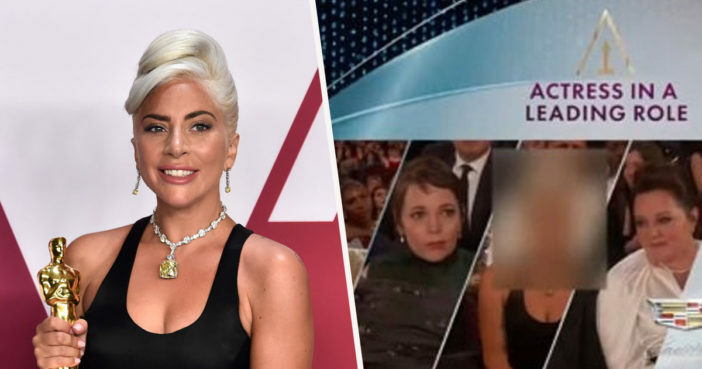 These screenshots showed how Gaga’s face had been blurred out with a square during the ceremony, while other actors in the Best Actress category – Olivia Colman, Glenn Close, Yalitza Aparicio and Melissa McCarthy – remained visible. Another screenshot showed how Mango TV’s website had also chosen to omit Gaga from a web page detailing the 2019 nominees for Best Actress. Fans reacted with understandable outrage at this apparently ‘disrespectful’ gesture, calling upon Mango TV to explain themselves to disappointed Chinese fans. Chinese monsters are so angry about this, Mango TV is wrong! And China Central Television (CCTV) love Lady Gaga. I know because I’m Chinese, plz dont hate Chinese, because lots of Chinese monsters cannot say anything HERE. Chinese monsters are sad about that. btw stream shallow plz! As reported by Yahoo Finance, Lady Gaga was placed on a list of hostile foreigners by China’s Communist Party in 2016 on account of her meeting with the Dalai Lama. Chinese monsters are so angry about this, Mango TV is wrong! And China Central Television (CCTV) love Lady Gaga❤. I know because I'm Chinese, plz dont hate Chinese, because lots of Chinese monsters cannot say anything HERE. This wasn’t the only part of the Oscars broadcast which was significantly altered by Mango TV. The channel also edited Rami Malek’s Best Actor acceptance speech to cut his description of Freddie Mercury as a ‘gay man’. We made a film about a gay man, an immigrant, who lived his life unapologetically himself. However, Mango TV chose to swap the words ‘gay man’, for ‘special group’, leading many concerned people to view this as an example of homophobic censorship. It's pretty obvious that #RamiMalek #BestActor #Oscar was at least in part fuelled by #sjw #lgbt #progressive portrayal of gay icon. Congrats China #mango TV for staying #traditional and changing #gay to #specialgroup – being 'offended' should work both ways – mutual respect. Mango TV have previously come under fire for homophobic censorship. During the 2018 Eurovision Song Contest, they blurred out references to the LGBT community, including rainbow flags which the audience had been waving.